Conditions for the contest. No purchase neccessary. This contest starts at 12:01 am EST on April 12, 2019. Every month there will be ONE winner. Winner will be contacted through email or phone by the representative of BabyJoy.ca. Winner will be contacted on the first week of every month or next five (5) business days. The contest is open to the residents of Canada and USA over the age of majority. No purchase is necessary to win. All entrants must SIGN UP to register for the contest. 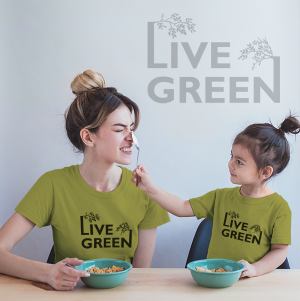 Winner will receive Matching family Mom-and-daughter organic t-shirts (Live Green) from BabyJoy.ca. The odds of winning depend on the total number of eligible entries received. Acceptance of the prize includes winner permission to use his or her name in any promotion carried out by BabyJoy.ca. Each prize must be accepted as an awarded and no substitution, transfer, conversion or assignment of Prizes will be allowed. BabyJoy.ca will notify the winner by email within five (5) business days of the draw date. The winner will have seven (7) calendar days from the notification to accept the Prize by email. BabyJoy.ca is not responsible for and shall not be liable for late, lost, misdirected, or unsuccessful efforts to notify the winner. Winner is responsible to provide valid and eligible email address. If a selected Entrant cannot be contact within the allotted time BabyJoy.ca reserves the right to void that entry and select another eligible Entrant for that Prize. The winner will be required to correctly answer a mathematical skill testing question. For verification reason, winner will also be required to register with complete name and home address on the BabyJoy.ca website. All the information collected will be confidential and will not be shared with any third parties. 2019 © BabyJoy.ca reserved the rights to terminate or cancel the contest any time without prior notice.